My new blog post about China. 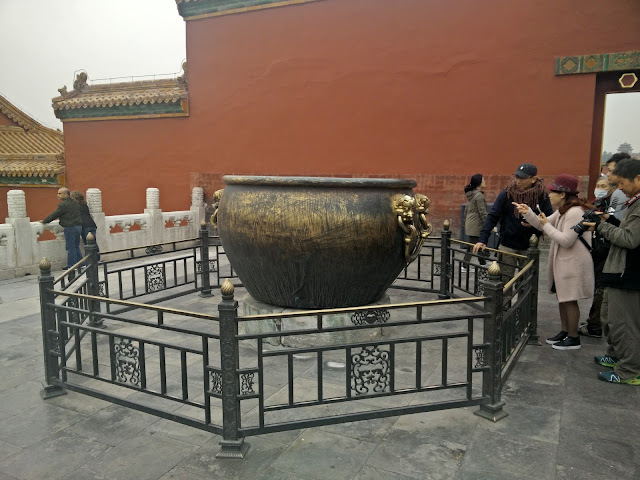 Forbidden City – Zijin Cheng, 紫禁城; pinyin: Zǐjinchéng; literally: “Purple Forbidden City”. Also known as “The Palace Museum” (故宫博物院). Above Meridian Gate (Wu Men). From the balcony the emperor would review his armies and perform ceremonies marking the start of new calendar. 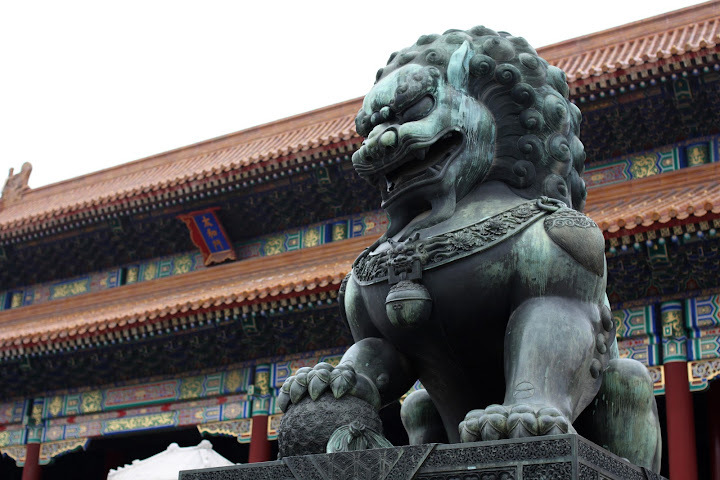 Forbidden City is located in the center of Beijing just north from Tian’an Men Square. It’s huge. It really is. Even though I watched travel videos and pictures before we went I was surprised by its size. It really is a city within a city. 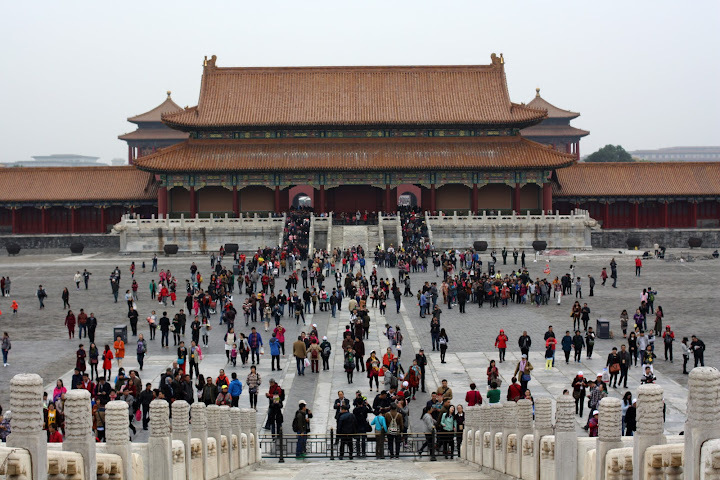 We devoted one day to sightseeing it and we were able to see Outer Court, Inner Court and some of the Eastern Palaces. We didn’t get to see the Western ones. There were crowds inside. To be able to see anything inside the building you had to seriously be good with your elbows and persistent. People would use any, even the smallest space to get ahead of you. This was mainly a problem in Outer and Inner City not so much after that. Five marble bridges, symbolizing the five cardinal virtues of Confucianism (Ren, Yi, Zhi, Xin, Li), cross the Golden Water, which flows from west to east in a course designed to resemble the jade belt worn by officials. Pairs of lions guard the entrances to the halls. The male is portrayed with a ball under his paw, while the female has a lion cub. Hall of Supreme Harmony is the larges hall in the Palace. It was used for major occasions. Inside the hall there is an ornate throne and a very ornate ceiling. Not much else besides the two. Marble Carriageway leads to the hall. The central ramp is carved with dragons chasing pearls among clouds and was reserved for the emperor. An odd number of roof guardians, all associated with water, are supposed to protect the building from fire. Copper and iron vats were part of the fire-fighting equipment. They were filled with water to be used to douse fires. From October to February every year, the vats were covered with quilts to prevent the water freezing, and on very cold days they would be heated by charcoal fires. The Qing Dynasty vats had two beast shaped bronze rings, a big belly and small mouth. Now it seems everyone believes that rubbing heads of those beasts brings good luck. Behind the Hall of Supreme Harmony there is The Hall of Middle Harmony (Zhonghe dian) and The Hall of Preserving Harmony. At the Hall of Central Harmony emperor received homage from officials in charge of ceremonial matters before he proceeded to hold court or lead ceremonies at the Hall of Supreme Harmony. The phrase ‘Central Harmony’ derives from the book of Rites in which it refers to impartial and just conduct appropriate to each situation. The hall was also used before he went to the Altar of Agriculture to ceremonially plough the earth and sow seeds every spring, as it was here that he inspected the seeds and the farming tools to be used before the ceremony. Great Wall of China (万里长城) one of the most recognizable structures in the World. It was originally a series of separate sections build by individual states. Later joined together and made bigger and stronger, are now collectively referred to as the Great Wall. The wall enabled speedy communications via smoke, flares, drums, and bells, as well as allowing for the rapid transport of troops across the country. It begins in the east at Shanhaiguan in Hebei province and ends at Jiayuguan in Gansu province to the west. Its main body consists of walls, horse tracks, watch towers, and shelters on the wall, and includes fortresses and passes along the Wall. The day day was cold and foggy when we decided to see the Wall. We chose Badaling as it was close and there is a cable cart which brings you up close to one of the towers. I didn’t expect it to be so steep. Even though it was out of season it was still very crowded and we slowly made our way up. We couldn’t see further than 2 meters and lost hope it’s gonna change. We went to Poland for a wedding and got one day to get away from the city of Wroclaw and sightsee. Gorka Castle was build as a summer residence of Wlostowic family. Then from XII to XIX it became a cloister and was systematically expanded. It is surrounded by Sleza Landscape Park. 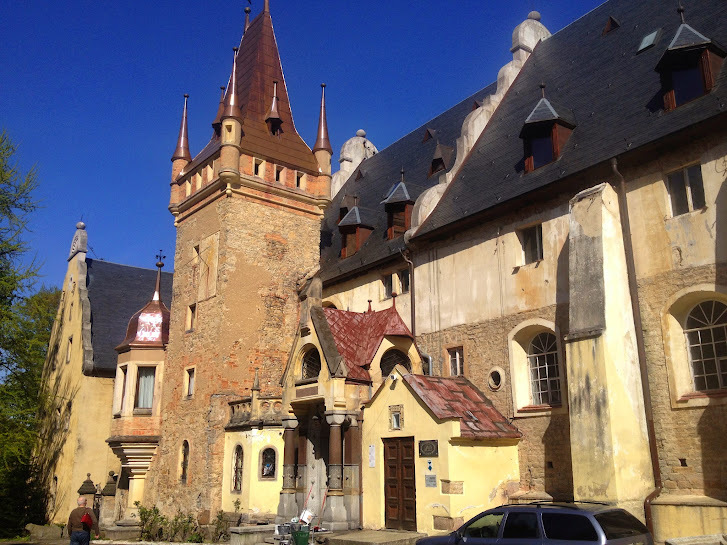 Today the castle is being renovated and serves as a hotel. You can see the gallery here. The castle was being renovated when we got there. A bit disappointing considering pictures I would have liked to take however it was still magnificent and impressive. It’s called by many names among them: Rock of Cashel, St. Patrick’s Rock, Carraig Phádraig or Cashel of the Kings. It is said to be a place where St. Patrick converted Aenghus the King of Munster. Please do visit new Facebook profile for more pictures here. We didn’t know Cahir Castle will be closed for maintenance until March 2015 so on a lovely sunny day in March we headed down to Cork and Cahir. Yes the castle was closed and the Swiss Cottage was closed. Bad luck. Both sights look amazing even if you can’t go inside. Cahir Castle is a stronghold located on a small island on river Suir. It’s one of the biggest castles in Ireland I’ve seen. After walking around the castle we decided to follow the trail to Swiss Cottage. It’s a nice walk leading along the river. We only got a glimpse of it through the back gate but it looks like taken out of fairy tale. Enjoy the pictures! Howth is located on the peninsula of Howth Head north from Dublin. You can get there by DART from Dublin Connolly station. If the weather is nice it’s a lovely spot for a day out, picnic and even swimming. Howth is a popular area for sailing. You can also spot various birds (razorbill, guillemot, fulmar, kittiwake, stonechat, linnet, whitethroat, yellowhammer, skylark, wheatear, peregrine, buzzard and kestrel) and seals. 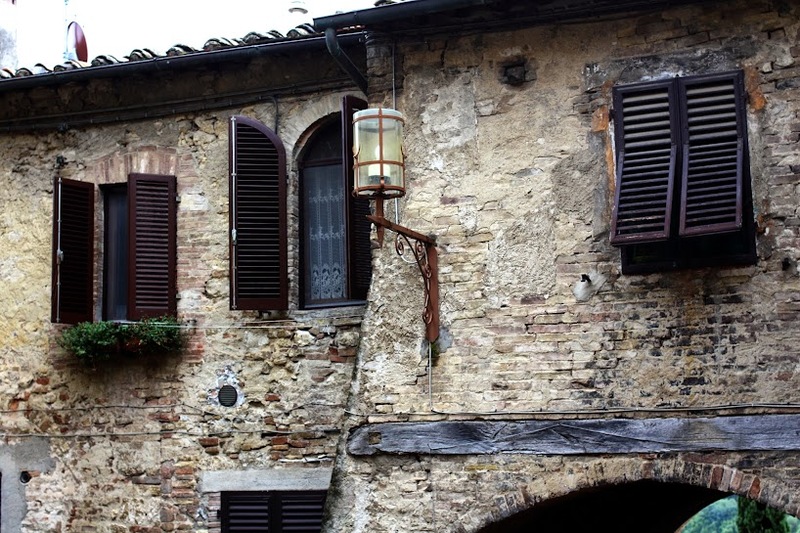 The foundation of San Gimignano (San Gimignano delle belle Torri) dates back to ancient times. According to legend, in 63 B.C. two brothers, Muzio and Silvio, two young patricians escaping from Rome after their implication in the conspiracy of Catiline, sheltered in Valdelsa and built two castles: the Castle of Mucchio and the Castle of Silvia, which would develop in the future San Gimignano. We arrived to San Gimignano in early September 2014. One of the worst summers as they told us on arrival. It was mostly wet mornings and sunny afternoons, but the views and delicious food made up for the weather. We stayed in Residenza D’Epoca Palazzo Buonaccorsi. A double room overlooking inner courtyard. Palazzo Buonaccorsi is an ancient building (XIII century) in the historical centre just 50mt from the gate San Matteo. We drove in to the city to unpack our luggage and then guided by the hospitable receptionist found a free parking outside the walls of old town. San Gimignano is famous for its skyline of its medieval towers, of the 72 towers in the fourteenth century, only 14 remain. In 1990 the town was also registered in the list of UNESCO’s World Cultural and Natural Heritage. 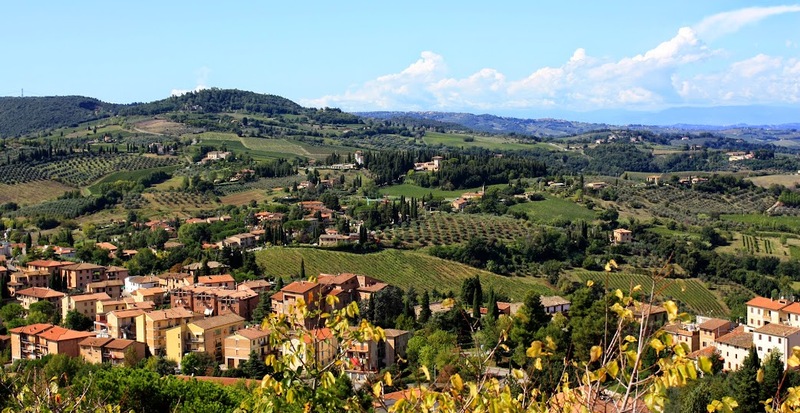 San Gimignano is surrounded by gorgeous countryside dotted with vineyards and olive groves. The main typical products of this land are fine wines, such as Vernaccia di San Gimignano, and saffron, that are produced here since medieval times.